The Class 3A No. 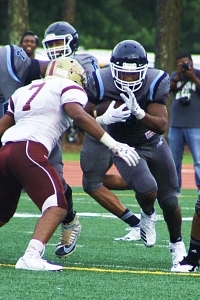 2 ranked Cedar Grove Saints begin the quest to defend their 2017 Region 5-3A title by hosting the Lovett Lions on Friday night at 7:30 on the turf at Godfrey Stadium. Cedar Grove (3-1) enters the contest ranked and will be the fourth ranked team Lovett (1-3) has face so far this season. The Saints are led by senior receiver Jadon Haselwood who is rated as the No. 1 receiver in the country and are coming off a bye week following a hard fought 24-17 loss to Class 7A No. 9 ranked McEachern two weeks ago. Haselwood had 20 catches for 260 yards and two touchdowns, but also plays a big role on defense and special teams. He returned an interception 60 yards for a touchdown in the game with McEachern. Cedar Grove’s rushing attack is led by Robert Jones III who had 349 yards rushing on 38 carries (9.2 yards/carry) and four touchdowns including a long run for a score against McEachern. Freshman Rashad Dubinion has 27 carries for 204 yards (7.6/carry) and two touchdowns. Senior Kendal Boney (3 rushing touchdowns, 15-22, 168 yards, 1 TD passing) and sophomore Austin Smith (30-43 passing, 297 yards, 4 touchdowns) lead a two-headed quarterback attack. Senior Rashad Jordan adds 12 catches for 117 yards and a touchdown in the passing attack. Lovett has given up 24, 40 and 58 points against the likes of Class 3A No. 6 ranked Greater Atlanta Christian, Class 4A No. 6 ranked Marist (3-1) and Class 4A No. 3 ranked Mary Persons (4-0). Outside linebacker Nick Jackson leads the Lions’ defense with 39 tackles averaging almost 10 a game with 1.5 sacks and a blocked punt on the season. The Lions are led by quarterback Blaine McAllister (616 yards passing, 5 TDs, 5 INTs) and receivers Kj Wallace (24 receptions, 204 yards, 2 TDs) and Jackson (12 receptions, 169 yards). Lovett has found the going tough running the ball as no back has more than 100 yards total for the season. The Saints’ defense is led by junior linebacker Isaiah Ratcliffe and senior defensive lineman Rashad Chaney (Alabama commit). In other Region 5-3A openers this weekend, Towers (0-4) is hosting Westminster (2-2) at Hallford Stadium in a 5:15 pm game and Redan (0-4) travels to Pace Academy (2-2) for a 7:30 pm kickoff. Lions look for win No. 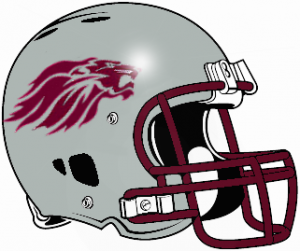 2 in Region 4-6A in a key match-up with Mundy’s Mill on Thursday, 7:00 pm at Twelve Oaks Stadium. Martin Luther King Jr. (1-2, 1-0) has a key Region 4-6A matchup with Mundy’s Mill (3-2, 1-2) on Thursday night in a 7:00 kickoff at Twelve Oaks Stadium. King is coming off a 28-21 battle with Mt. Zion-Jonesboro last weekend for the first victory of the season, while Mundy’s Mill is trying to recover from a heartbreaking 36-35 overtime loss to Tucker at Adams Stadium last Friday. Tucker (2-2, 2-0) looks to go to 3-0 in the region as the No. 9 ranked Tigers travel to Southern Crescent Stadium on Friday night at 7:30 to take on Drew (1-3, 0-2). Stephenson takes the week off after improving to 3-1 overall and 2-0 in the region with its 34-8 win over Morrow last Thursday. DeKalb has four doubleheaders on Friday and 9 home games including Clarkston (0-5)/Forsyth Central (5:15 pm) and Lakeside (1-3) at 8:00 pm hosting Region 7-7A foe Meadowcreek (4-0) in the nightcap. Avondale Stadium is hosting a doubleheader as well with McNair (2-2) against Hapeville Charter (3-0) in Region 6-2A at 5:15 pm and Lithonia (3-1) facing off with Shiloh (1-3) at 8:00 pm. In addition to the Towers (0-4)/Westminster (2-2) game mentioned earlier Columbia (1-3) hosts undefeated Stockbridge (4-0) at 8:00 pm. Cross Keys (0-5) hosts Bremen (3-0) in the 5:15 game at North DeKalb Stadium followed by Dunwoody (1-3) hosting Alpharetta (2-1) in the 8:00 pm nightcap.